On November 14, 1997, Richard L. Wallace was appointed Chancellor of the University of Missouri-Columbia, his campus home since 1966. He served as Chancellor until September, 2004, and his leadership was notable for strategic planning; an open budget process; the fastest growth rate in federal research support in the Association of American Universities; a focus on the life sciences; increases in the size, academic accomplishment and diversity of entering classes; significant growth in private fund-raising; and partnerships with other institutions. Chancellor Wallace began his collegiate career as a student at Northwestern University where he graduated with a bachelor’s degree in journalism in 1958. He earned a doctorate in economics from Vanderbilt University in 1965. After working as an instructor and assistant professor of economics at Florida State University from 1961-1966, Dr. Wallace was hired as an assistant professor of economics and community health and medical practices at MU. He quickly rose through the ranks to associate professor and then professor, with research and teaching interests related primarily to public utility regulation and health economics. From 1975-1996, he also chaired the planning committee for a national symposium on public utility regulation. At the University of Missouri, Dr. Wallace served in several administrative roles. From 1967-1970, he served as chair of the Department of Economics. Two years later, he became director of the Business and Public Administration Research Center, serving concurrently as assistant dean for research in the College of Administration and Public Affairs until 1974. From 1975-1978, Dr. Wallace was associate dean of the Graduate School with responsibilities that included academic computing, graduate fellowship programs and the school’s budget. He served as interim dean of the Graduate School for a year before he returned to the role of associate dean and assumed responsibility for the Office of Research until 1982. Dr. Wallace next served as interim dean of the College of Arts and Science from 1982-1983, during which time he developed a computer-based information system and an academic planning process for the college. In 1983, he became associate provost, a position he held for two years during which he was a key player in University planning and program review. 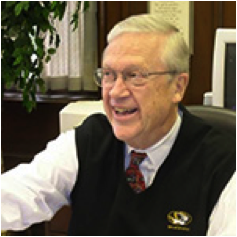 During 1983-84, Dr. Wallace served as a special assistant to the University Of Missouri Board Of Curators and worked with an outside consultant to develop a strategic planning process for the university system. This process guided system level resource allocation for several years in the mid-1980s. For the last half of 1984, Dr. Wallace served as Acting Vice President for Academic Affairs of the university system. Dr. Wallace was then appointed associate vice president for academic affairs and served in this role until 1989 when he became vice president for academic affairs. He served in this role from 1989 to 1996, and was responsible to the President and the Board of Curators for UM policies on academic programs, personnel, planning, and the promotion of quality in research and scholarship. The University of Missouri Press as well as several other operating programs reported directly to Dr. Wallace. Wallace was named interim chancellor of the University of Missouri-Columbia in July, 1996, and then chancellor in November, 1997.